I wish I could take credit for this recipe because quite frankly...it's amazing! Thank you to Monique at Ambitious Kitchen for this remarkable recipe! I have fallen in love with MANY of her dessert recipes. Gluten free baking is tricky business and I don't like to mess with perfection. Try out her Black Bean Avocado Brownies too...delicious! Now to the Blondies! I'll post the recipe here, but please visit her website and check out her recipes and photos! Spread batter evenly in prepared pan then sprinkle 2 tablespoons of chocolate chips on top. (The batter may stick to your spatula, so I like to spray my spatula with nonstick cooking spray first.) Bake for 20-25 minutes or until toothpick comes out clean and edges are a tiny bit brown. The batter may look underdone, but you don’t want them to dry out! For variations and nutrition information, visit the Ambitious Kitchen website. 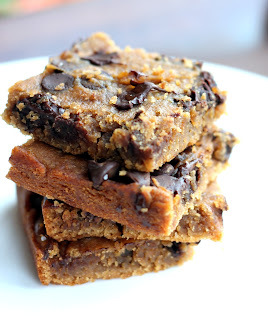 These are amazing - I never thought about using chickpeas in brownies, but these are now my favorite brownies. I try to eat healthy, now I can have a delicious treat when I get the urge for something sweet! I'm so glad you enjoy them, Diana!